Who should use Plexus VitalBiome? No, contains dairy and soy. What is the difference between VitalBiome and ProBio 5? Is VitalBiome safe for pregnant or nursing women? While most physicians approve the use of probiotics with pregnant or nursing women, please consult with your physician prior to use. 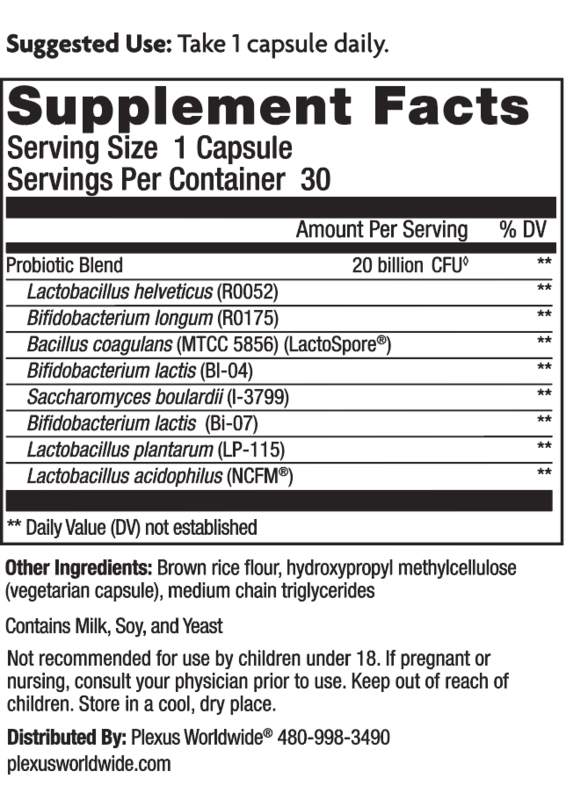 VitalBiome contains Saccharomyces Boulardii (I-3799), a hardy probiotic yeast that can survive the harsh journey to the intestinal tract where it is shown to support digestive health. Does the CFU amount in VitalBiome remain the same through the expiration date? The lot number is a 6 digit number found on the bottom of the VitalBiome bottle along with the expiration date of the product. Yes, VitalBiome is safe. Plexus meets or exceeds all regulatory standards and guidelines for product safety and efficacy.